Epiphany Cardiography Products, LLC is proud to announce that KLAS awarded it “Category Leader” for ECG Data Management in the Best in KLAS: Software & Services report for 2011. “All of us at Epiphany are truly honored to be named “Category Leader” for ECG Management by KLAS for the third consecutive year,” states Allison Fawber, Marketing and Communications Manager at Epiphany. Epiphany Cardiography Products, LLC is proud to announce that KLAS awarded it “Category Leader” for ECG Data Management in the Best in KLAS: Software & Services report for 2011. KLAS helps healthcare providers make informed technology decisions by reporting accurate, honest, and impartial vendor performance data. Epiphany has received the “Category Leader” award for its vendor-neutral ECG management application in 2009, 2010 and again for 2011. Epiphany’s Cardio Server is a browser-based, intuitive management system application that receives, manages, and exports diagnostic test results to EMRs. Cardio Server communicates with over 100 devices, from over 40 vendors, in 15 diagnostic modalities. 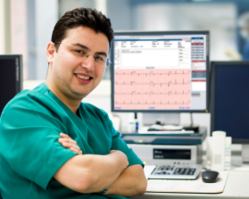 Physicians and other users can access and edit ECG data and other diagnostic test results from anywhere in the hospital, the office, or home using a standard web browser. Users are also able to access ECGs from an iPad, iPhone, or Android Phone. Founded in 2004, Epiphany’s mission is “to simplify the collection and management of diagnostic test results. With over 350 hospital users in the US and abroad, Epiphany is committed to serving its customers’ needs through product innovation and the delivery of exceptional service with an unwavering dedication of driving open systems. Discover why Epiphany is preferred when managing multi-vendor, multi-modality diagnostic test results.